Start off your visit on the 2nd (Fri): take a tour by water with Boat Tours & Water Sports. Get ready for a full day of sightseeing on the next day: explore the galleries of Hamilton Island Art Gallery, enjoy the sand and surf at Catseye Beach, and then head outdoors with Jetryder. For maps, other places to visit, photos, and tourist information, read Hamilton Island trip website . London, UK to Hamilton Island is an approximately 28-hour flight. You can also do a combination of flight, bus, and ferry. Traveling from London to Hamilton Island, you'll lose 10 hours due to the time zone difference. Traveling from London in August, you can expect nighttime temperatures to be somewhat warmer in Hamilton Island, with lows of 21°C. 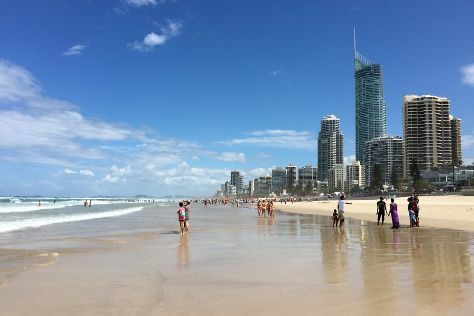 Finish up your sightseeing early on the 3rd (Sat) so you can travel to Gold Coast. Start off your visit on the 4th (Sun): view the masterpieces at Tweed Regional Gallery & Margaret Olley Art Centre, then tour the pleasant surroundings at Burleigh Heads Beach, and then stroll through Surfers Paradise Beach. Get ready for a full day of sightseeing on the next day: observe the fascinating underwater world at Sea World Theme Park. To see more things to do, traveler tips, maps, and other tourist information, refer to the Gold Coast driving holiday tool . Getting from Hamilton Island to Gold Coast by combination of flight and train takes about 5 hours. Other options: do a combination of ferry, bus, and train; or do a combination of ferry and bus. Traveling from Hamilton Island in August, Gold Coast is little chillier at night with lows of 11°C. Wrap up your sightseeing on the 5th (Mon) early enough to travel to Sydney. For shopping fun, head to Sydney Fish Market or Brett Whiteley Studio. 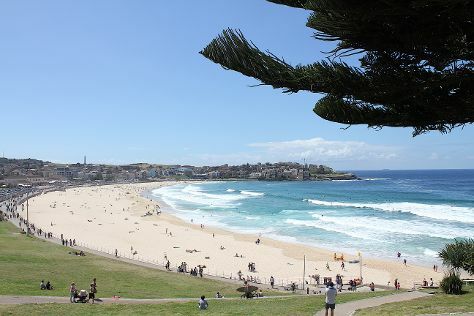 Your itinerary includes some good beach time at Bondi Beach and Manly Beach. And it doesn't end there: snap pictures at Sydney Harbour Bridge, hike along The Opera House to the Botanic Gardens Walk, get up close and personal with brilliant marine life at Sea Life Sydney Aquarium, and don't miss a visit to Queen Victoria Building. To see maps, more things to do, where to stay, and tourist information, go to the Sydney online trip planner . Fly from Gold Coast to Sydney in 3.5 hours. Alternatively, you can do a combination of train and flight; or drive. Expect slightly colder weather when traveling from Gold Coast in August: highs in Sydney hover around 22°C, while lows dip to 11°C. Cap off your sightseeing on the 9th (Fri) early enough to travel back home.